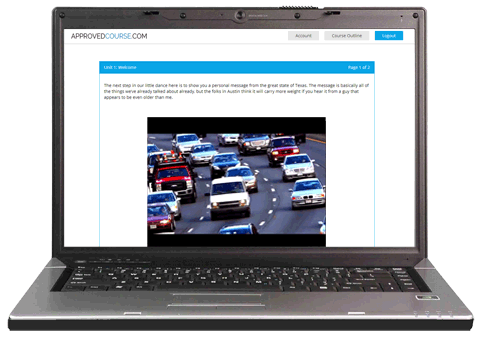 Ticket dismissal just got easier with the addition of our new all video course. Enjoy all the advantages of taking your course online with one important twist - NO READING. Push play and let us do the rest! User-Friendly - Watching is Easier Than Reading, Right? Fastest Options - Instant Electronic Certificates Available! Dismissing a ticket with an online driver safety course has always been an advantage over dismissing a ticket with traditional defensive driving. Who has time to deal with the hassle of finding a defensive driving class and then finding six hours of their lives to attend it? Our new video course takes the convenience of the online course and does it one better. No longer do you have to read that ticket away, all you have to do is watch! Convenience Makes Online Defensive Driving Courses Great! Save the trouble of traveling to a place that you don't want to go to do a thing that you don't want to do and sacrificing six hours of your life that you don't have to spare doing it. If you can connect to the internet, your classroom can be anywhere you want it to be. You can even choose the size of your classroom. Our video course can not only be enjoyed from your Mac or PC, you can also access it from an Android or iOS tablet or smartphone. While it's fun to get a surprise from time to time, it is no fun if that surprise comes in the form of a hidden fee. The cost of your registration including video course, certificate and first class delivery by the USPS is $34.95, period. Save time and money the online way. 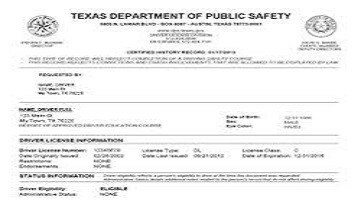 If you are short on time we do offer expedited certificate shipping options and certified driving records from the TX DPS. You'll find the fees for these services clearly "hidden" on our registration page. Our online video defensive driving course saves you the effort and eyestrain of reading page after page of text from your computer screen. We believe a person learns best when they are comfortable and at ease. Don't spend your time squinting at your screen, sit back, relax, enjoy and learn. And don't worry about remembering everything you have learned until the course is all over. There are short, multiple-choice quizzes at the end of every unit so you can answer the questions while the information is still fresh on your mind. A little confession. The folks here at ApprovedCourse.com have taken a defensive driving class or two ourselves and, by and large, we found most of them to be a beating. Part of the reason that we are in this business is that we were convinced that there had to be a better way. Without question, safe driving is a serious topic, but know that we have taken serious effort to make talking about it as fun as it can be. Hopefully you're not one of "those guys" who has taken a Texas defensive driving course 49 times and knows how it works better than we do. Whether this is your first time or it's just been a long time, it is understandable that you might have a question or two along the way. If you can't find the answer you need here, our Texas-based team is available to help by phone or email every day of the year. Why Do I Need My Driving Record? Texas state law only allows drivers to dismiss moving violations with a defensive driving class once every 12 months. When the court asks you to submit a copy of your driving record, it is doing so to ensure that you are in compliance with that law. It's also not a bad idea to order a copy of your driving record from time to time to check it for accuracy. Just as with your credit report, mistakes can cost you money. Your car insurance company uses your driving record to set your rates so make sure that it is accurate to help keep your premiums down. Follow the law and save time and money by ordering our video course/driving record package for only $59.95. Check out the details on our course registration page. Texas Defensive Driving the Quick and Easy Way!